As I grew up there were two ways I knew my grandfather was blind in one eye. One way was that I was sometimes warned, “Be careful. You don’t want to lose your eye like Grandpa.” Mom and Dad will probably disagree that Grandpa was used as a warning to me, but I know the truth in this respect . . . . The other way I knew was that he had one blue eye, just like mine, and he had one green eye. Everybody else I knew had two eyes of the same color. In this next part of Grandpa’s story he tells Connie what happened to his eye. In 1911, Grandpa’s eye was treated at the University of Michigan hospital in Ann Arbor, about 100 miles away from his home. I imagine the worried parents and the frightened boy travelling all that way on “streetcar, train and horse-drawn carriages.” What would that trip be like today? A visit in the car or ambulance to the nearest hospital, then perhaps a drive of an hour and a half to the medical center? In an ambulance or a car, depending on the urgency. The car would have the boy’s car seat in it. What was it like for him? Was he carried as they moved from one mode of transportation to the next? I believe it’s likely that he was seen at the old hospital in Ann Arbor on Catherine Street. It is no longer there as it was replaced by the 700-bed University Hospital in 1925. Today it’s hard to imagine letting your three-year-old play with a needle, but in those days children learned how to perform daily chores and trades at their parents’ sides. The description of Grandpa bouncing off the table from being shocked by the X-ray machine is frightening. When I looked up the history of X-rays on Wikipedia, it was even more frightening. 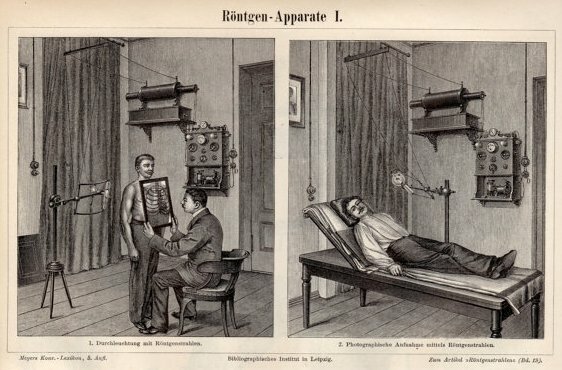 Although a lot of research led up to the moment, X-rays were not actually “discovered” until 1895. The site states, “The first use of X-rays under clinical conditions was by John Hall-Edwards in Birmingham, England on 11 January 1896, when he radiographed a needle stuck in the hand of an associate.” Since Grandpa’s injury was in 1911 and UM had only had the machine for twelve years, that means that they bought one of the first machines in 1899. I understand that Grandpa’s medical records from 1911 are still stored at the University of Michigan. I hope I will be privileged to see a copy of them some day. Grandpa’s stoic attitude about his blind eye was typical of his personality. He didn’t show emotion very often, and he was quite practical. He loved his routines. His talent with routines and his prodigious memory proved invaluable when he became completely blind. I hope you’ll stay tuned for Part IV of Grandpa’s story . . . .
That’s a really wonderful contrast in how children’s safety issues have changed through the years. Amazing about the use of X-rays and treatments and travel, too…incredible story! Sheila, isn’t it amazing? We are so much more protective (over-protective?) today. It was so interesting to see early medical diagnostic equipment like that and see it intersect with Grandpa’s life. I never really thought of how history impacted my relatives before I was around! Very interesting. 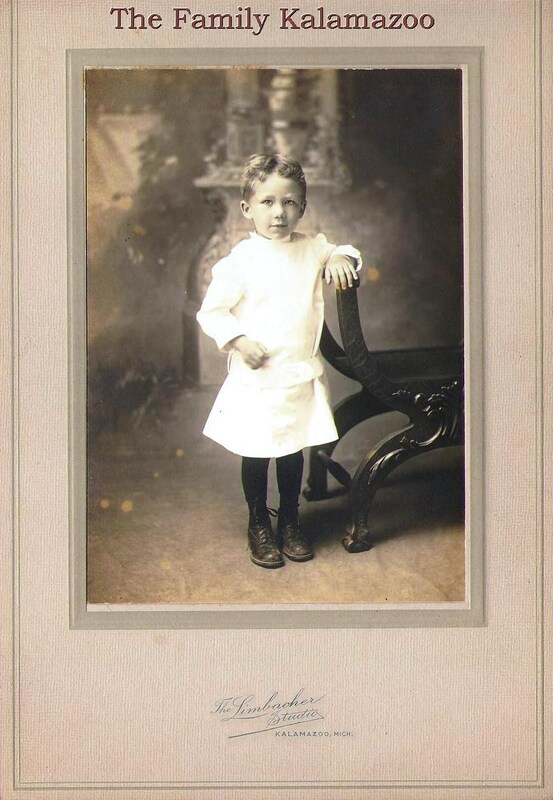 Your grandfather is not the only little West Michigan boy of that era who went to Ann Arbor for special health care. One of my students, Dr. Millard Roberts (born in Schoolcraft, 1908 – died Kentwood, 2008), went to Ann Arbor. His mom had died when he was tiny, and his farmer father married her sister — not uncommon. The sister was a Christian Scientist, so when little Millard became ill, she called in a “reader.” Millard’s health continued to decline. His father sent him to relatives who took him to the U of M hospital, where after a long time he was declared cured. I’m sorry I can’t recall his ailment! Maybe be something with his throat.These relatives were childless and later funded his medical education. He became a general practitioner, but during WWII, the shortage of doctors led him to get training in surgery. Thus he became a successful surgeon in Kalamazoo. I really liked Millard. Anyway, the U of M Hospital was where kids were sent when parents were desperate. This makes me think that your grandfather’s parents adored him. Wilma, what a wonderful story. He was born the same year as my grandfather! Interesting how he became a doctor and a surgeon, although his stepmother (and mother?) was a Christian Scientist. I love how Dr. Roberts was one of your students :). 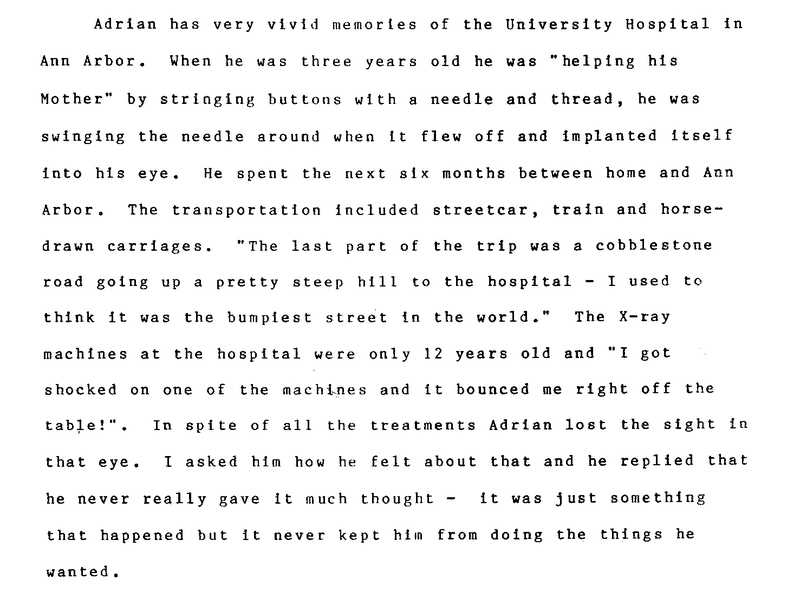 I really like this story since I work with Eye Care instruments. We definitely have come a long way with our technology since that time. By the time Grandpa was elderly things had changed and I believe (if I remember correctly) that he had surgery on the injured eye that repaired some of the damage (Mom, correct me if I’m wrong!). But even in the last 15 years hasn’t the technology exploded? I know they are doing amazing things. By the way, the reason he became completely blind was because he had glaucoma which runs in the family. He was a pretty cute kid and a handsome guy later on. Thanks, Catherine! It is so great that you are able to put these stories down for the future generations. Thanks, GP. I hope they will enjoy them!